The primary reason for the sweeping of chimneys is to remove flammable creosote to aid in the prevention of chimney fires. These extremely fierce fires can be very dangerous and possibly lead to house fires and loss of life. Secondary reasons for sweeping of flues are to ensure a clear passage way which the toxic exhaust gasses can escape through. Deaths through carbon monoxide poisoning have been well documented in the press and a major cause is a blocked flue way. How often should your chimney be cleaned? What will sweeping your chimney achieve? Sweeping your chimney will greatly reduce the build-up of creosote and soot and hence minimise the risk of chimney fire, soot falls and blockages. Obstructions such as Bird Nests, Soot falls, Building Debris and even leafs and cobwebs can be removed. A smoke draw test will be performed on all chimneys at no extra charge. 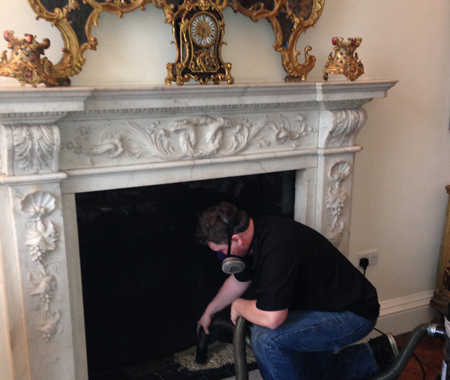 A clean sweep chimney sweep can provide valuable advice on many different aspects of your fireplace, flue, terminal and ventilation requirements as well as a multitude of other things appertaining to heating your house safely and efficiently with minimal impact on the environment.